There are some albums that hit your soul and open your mind. There are some albums that leave you in amazement at how perfect it flows, how the synergy of beats and rhymes go so well together. This album, released in August 1998, was definitely one of those. 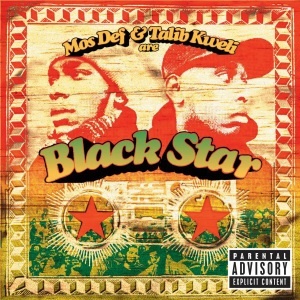 After making their name on the underground scene, Mos and Talib, known collectively as Blackstar, worked with Hi-Tek to create an album that is undeniably classic, as well as awakened. The zone that Mos Def was in for this album is one that I think any artist would aspire to be in. Mos was at his best, outshining Kweli on a number of tracks, and that's not taking anything away from Talib, who also brought the heat as well. This was just Mos in his prime, killing everything he rapped on. Let us take a look at this album, shall we? From the opening boom bap of "Astronomy", provided by the criminally underrated Da Beatminerz(one of the few producers on the album besides Hi-Tek), Mos and Kweli kick some amazing lyrics and drop the knowledge they would become known for. The back to back punch of "Definition" and "RE: Definition" keep the feel going, as Mos and Kweli coast over Hi-Tek's head nodding track. Keeping up with the essence, Mos give us a track with a throwback feel in "Children's Story" and showcases his storytelling ability, while paying homage to Slick Rick as well. The album hits the smoothest point when Mos and Kweli talk about their love for the beautiful black queens on "Brown Skin Lady". The smooth soulful jazzy track, produced by J. Rawls, allows Mos and Kweli to uplift the ladies of color, with the melodic chorus being as infectious as anything I've ever heard. As good as the album was up until this point, we reach the absolute apex of the album once we get to "K.O.S. (Determination)", as the music starts to elevate even higher here. Kweli drops wisdom and some strong lyrics, backed by the jazzy beat and the sung hook from Vinja Monica. The elevation continues with "Hater Players", as Mos murders all competition with one of his dopest verses ever. Kweli doesn't slouch a bit on this track either, as he pulls wack MCs cards as well, but Mos just goes above and beyond flow and lyric wise to show you what MCing is all about. The final three songs on this album are some of the best music I have heard ever in hip hop, starting with the Common assisted "Respiration". Hi-Tek provides one of his greatest productions as Mos kicks off the song with another spectacular verse. Kweli hits hard on this track, speaking some of his realest lyrics in his verse, while Common adds his own perspective to the song, with a great verse in his own right. Mos, Kweli, and Common spitting over one of Hi-Tek's best beats? It doesn't get any better than this. "Thieves In The Night" is beauty in musical form and my favorite song on this project. As the 88-Keys production begins, somber yet jazzy, Kweli jumps right into it with one of his most awakened verses, touching on issues amongst our people, the industry, the government and so much more. The hook itself is almost another quotable verse alone. When Mos begins his verse, I was blown away and at the end of the verse, it quickly made its way on my all time favorite verses list. The focus, the wordplay, the flow, the delivery... This is one of the greatest verses of all time. Hands down. This song is an all time classic for hip hop, just like "Respiration". The final song on the album is a huge cipher essentially with Jane Doe, Punchline, and Wordsworth titled "Twice Inna Lifetime", as the five MCs kick some dopeness over a standard boom bap production from Hi-Tek. This also embodies the essence of hip hop, where it is all about the skills and spitting the best of your lyrics. Kweli spazzes on this song with his most aggressive verse on the album, but once again Mos blacks out to close out the whole album, with some of the sickest wordplay he ever committed to wax. This is a rare feat, where two supreme solo MCs can come together to create greatness, and both Kweli and Mos are top tier lyricists and supreme solo MCs. This album is one of the best albums of the late 90s and a true classic. It needs to be discussed much more by all hip hop fans for sure. Blackstar, keep shining.